I remember the first time I saw the work of Rebecca Ringquist was when I was curating my very first fibers show. I also know that I was blown away and loved it immediately. Her work is dense and heavy with stitches, a combination of hand and machine work. I have had the privilege of exhibiting Rebecca’s work twice, visited her beautiful and cozy home studio here in Brooklyn, and even casually hang out a bit. The best thing is that Rebecca is a super talented artist and teacher but also a genuinely sweet and warm person. She recently had a solo show in Chicago and has lots of cool things coming up. I know you will love learn more about her work as I did. Let’s go! I live in Brooklyn, and the intensity of New York has definitely had an effect on my work. Since moving here, my palette has changed from mostly white to bright, saturated fluorescent colors. My studio is in my home that I share with my partner. I love being able to poke my head in there on days when I’m teaching or running errands just to check on the previous days progression. I usually work in the studio three days a week, and I guard those days very closely. I wake up early and check my e-mail,then I get dressed and get to work. Even though I work from home, I put on shoes and brush my teeth and get in there and shut the door. thread lots of needles and wind lots of bobbins. I get warmed up. When I lived in Chicago, I was on a swim team, and I found myself finding parallels there to the studio. You don’t just jump in and start swimming. You get in and flutter for a little while on the kick board. You drag around the pull buoy, and then finally, you swim longer sets. It’s the same in the studio. I’ve got to do lots of warming up. In general, I make a lot of sketched work to get to one or two really good finished works. A sketch from last month might be the spark for a new piece that I haven’t found out about yet. My studio is a mess. If it’s clean, it means I haven’t been working hard enough. I have a space for drawing (mostly pencil and gouache), another table for the sewing machine, and one big 8×12 wall covered in homosote for hanging up works in progress. The floor is covered in piles of cloth, boxes of found embroidery, and sketchbooks. I learned how to embroider in the context of a Feminist Art History class in college, and the work I made then was very much in response to the history of colonial samplers. While I still spend a lot of time thinking about these ideas (and teaching others about them as a professor at SAIC), my work is now a lot less obviously political. My work has gotten much more layered and dense and saturated with color than it was when I started working with these materials 15 years ago. Embroidery is traditionally a very neat and tidy craft, but my work transforms it into wild gestural maximalist drawings. You use a lot of old and found linens and embroideries, what made you begin to do this? I love old embroidery, and many years of living in the Midwest surrounded by the world’s best thrift stores helped me secure a huge collection of the stuff. Most of it travelled with me to New York. I use these old textiles as the ground layer (and midlayers) of lots of my work for a few reasons. Firstly, I am drawn to all this ready-made texture, and secondly, I’m interested in the stories that are already contained in the cloth. While most of the embroidered textiles I use are made from printed patterns, every single one of them is embroidered by hand by someone who made a lot of design decisions in an effort to make something beautiful. I describe my work as fractured narratives, and these found and collaged cloths contribute their own stories. I’ve been thinking a lot about weather these days, and making lots of drawings of tornadoes and rainbows. This has been a crazy year of cross country change, and the metaphors of weather are popping up in my drawings in lots of different ways. In Brooklyn, we’ve had a tornado, a hurricane, and an earthquake this year! When I’m not in the studio or teaching, I love to cook. At the end of a long day in the studio or a long day teaching, I find it so satisfying to walk into a clean kitchen and cook a great meal. Since my work takes forever to make, it feels so good to start and finish something at the end of the day. Believe it or not, in our little walk up apartment here in Brooklyn we have a deepfreeze in the dining room. I store away fruit and vegetables all summer, and all winter long we eat really well. Right now it’s full of homemade applesauce and the summers crop of homemade pesto. The freezer really appeals to my collector sensibilities. I went a little crazy on the home made oven dried tomatoes this year, but man o man have we been eating a lot of great focaccia this winter. Teaching informs my work so much. I taught Stitch (a class about the history and contemporary art practice of embroidery) and other studio classes in the Fiber and Material studies department at the School of the Art Institute of Chicago for seven years. Now that I live in New York I’m teaching workshops all over the country (as well as intensives back at SAIC). Teaching forces me to stay on top of the art world, as well as stay articulate about what it is I’m doing in my own studio. Right now I’m an artist in residence at the Museum of Art and Design here in New York, and that has also been a great experience for clarification. Visitors want to know how I get started, how I make design decisions, how I choose certain materials. It has been helpful for my own brain to break down the process into easy to understand steps. Right now (until July 2012) in New York you can see my work at the Museum of Art and Design (www.madmuseum.org) . You can also see me there most Wednesdays, working away in the 6th floor Artists in Residence studio. Packer Schopf Gallery (www.packergallery.com) in Chicago represents my work. I have a website (www.rebeccaringquist.com) and a blog (www.drop-cloth.blogspot.com) that I update frequently with works in progress and other studio related news. Isn’t her studio awesome and I totally want to see her freezer. That is so cool. Anyway so glad to have Rebecca share with us, thank you! Joetta Maue is a full time artist primarily using photography and fibers. 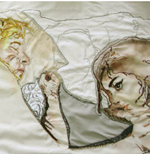 Her most recent work is a series of embroideries and images exploring intimacy. Joetta exhibits her work throughout the United States and internationally, and authors the art and craft blog Little Yellowbird as well as regularly contributes to Mr. X Stitch and the Textile Arts Center Blog. Next Post Next Post: NSFW Saturday – Come again? !